Everyone knows that The Empire Strikes Back is the greatest of all the Star Wars films. You’ve got the awesome Battle of Hoth, Luke’s training on Dagobah, the betrayal of Lando Calrissian, Boba Fett, Luke getting his hand cut off… Well, Zen Studios has decided to take all of these great moments and throw them into their Zen Pinball platform. To celebrate the inclusion of the greatest Star Wars film, Zen Studios has released a handful of screenshots and a trailer to tide us over, as well as a few details on what makes this table tick. Join Luke Skywalker as he embraces the power of the Force and leads the charge to repel the advances of Darth Vader and the Galactic Empire. 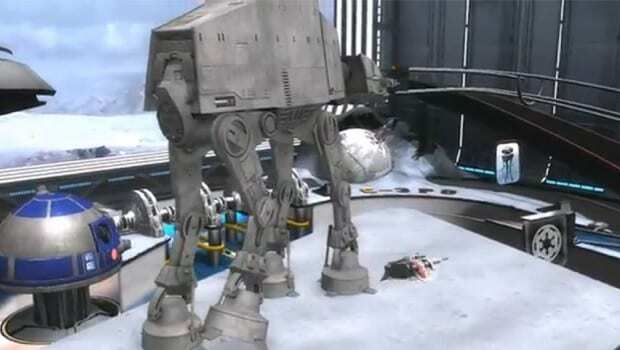 The experience would not be complete without a host of fully functional 3D objects including an AT-AT walker (with circling Snow Speeder! ), a Tie Fighter, Ion Cannon and of course the emblematic lightsabers of Luke Skywalker and Darth Vader. Activating missions on the Star Wars Episode V :The Empire Strikes Back table can be done by hitting the center bank and collecting the letters to spell out STAR WARS. You can then choose which scene to start, causing the Executor to jump to hyperspace and fly to the affected planet of the chosen scene. There are a total of five missions to complete before activating Wizard mode, which places you directly in an epic battle between Luke Skywalker and Darth Vader! These missions appear to be pretty involved, as the developers have actually included checkpoints in case you lose a ball while playing through them. No official release date yet, but we’re excited!